This blog entry has been inspired by a tweet by Roger Moorhouse (@Roger_Moorhouse). Today is the birthday of the infamous Josef Dietrich. A lot has been written on the infamous SS-General, so I will not bother to write something about him here. For everyone interested in the person of Dietrich I recommend reading “HITLER’S GLADIATOR” by Charles Messenger and “SS-Oberst-Gruppenführer und Generaloberst der Waffen-SS Joseph (Sepp) Dietrich.” by William T. Allbritton und Samuel W. Mitcham Jr in Hitlers militärische Elite. Vom Kriegsbeginn bis zum Weltkriegsende. Band 2, Primus Verlag, Darmstadt 1998. Down below you will find high-resolution images showing Sepp Dietrichs WW1 military files as stored by the state archive in Munich. 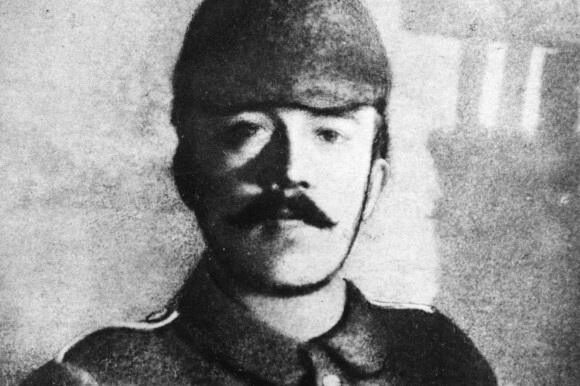 The files are quite interesting as they show that Dietrich never served in the 1st Regiment of Uhlans (which we would often claim after WW1) and they hold nothing on the Iron Cross 1st Class which he wore after WW1. That does not mean he did not get the award, he might have received it as late as the 1920s, but it’s certainly worth mentioning. 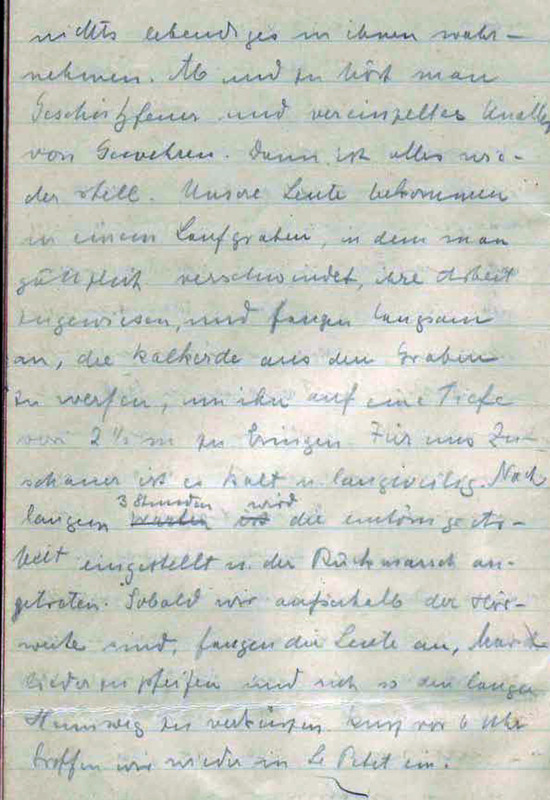 Messenger claims that Dietrich was wounded at the Somme (by shrapnel), but there are no details in the files concerning that wound. He spent three months in Hospital in 1915 and another two in 1915. These spells of hospitalization probably relate to the shrapnel wounds Dietrich received at the front (right upper leg and face). There is no mention to the wound to the face, of which Dietrich claimed that it was inflicted by the lance of a british Lancer, so I suppose he made this story up when he told people about the wound in his face. The only other hospitalization I can find is for “inflammation of the middle ear” in 1914. In his book “Hitlers Gladiator” Messenger also states that he could find no proof that Dietrich had fought on the Italian front and to have been awarded the Austrian Medal of Bravery. His service records clearly note that Dietrich served in Italy from the end of November 1917 to February 1918, although they indeed make no mention of the Austrian medal of bravery. 1914: enlisted in Bavarian 7th Field Artillery Regiment.Transfered to 6th Bavarian Reserve Artillery Regiment,Bavarian 6th Reserve Division (same Division as Hitler) in October. Fought at 1st Ypres. 1915:attended Bavarian artillery School at Sonthofen,NCO training.Returned to Bavarian 7th Artillery Regiment,Bavarian 1st Division fighting at the Somme. November 1916: transferred to Infantrie-Geschütz-Batterie 10 ,2.Sturmbataillion.Part of 3rd Army.Served in Champagne 1917. Awarded EKII November 1917 while in Italy. February 1918: joined 13. Bayerische Sturmpanzer-Kampfwagen-Abteilung as a gunner (using captured British Mk IV tanks). Training near Berlin from April 1918 (the gunners arrived in Berlin in April, the rest of the crews in January). May 1918: his tank detachment deployed to 7th Army,Chemin des Dames sector. 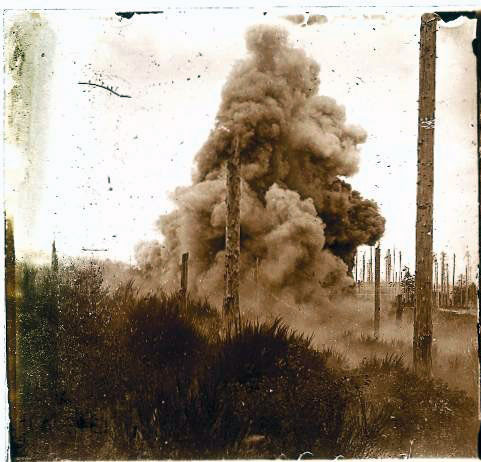 June 1918: saw action in tank attack near Rheims. July 1918:offensive near Soissons: Oct 1918:in tank battle near Cambrai. In November 1918 he seems to be back with the 7th Bavarian Artillery regiment again. This gravestone can be found on the battlefield of Jena. Below it rest the remains of the Saxon Premier-Lieutenant Freiherr August von Bissing, who was killed during the battle. When he was buried his body had already been plundered, leaving only a pair of monogrammed socks. Bissings wife Marianne never learned what happened to her husband and spent years trying to shed light on his fate. When she travelled the area years after the battle (1858) local farmers showed her the socks they had kept after they had buried Bissing. 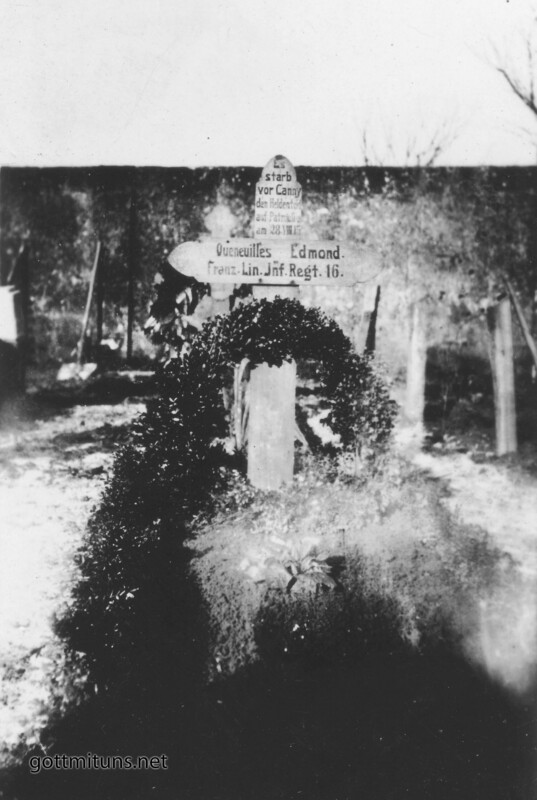 The monograms, which Marianne had stitched herself, finally revealed the final resting place of her husband. Marianne commissioned a memorial for him, but died shortly afterwards and was buried on the battlefield, right beside her husband. A nice little story which I thought worth sharing..
“Should a war break out now, its duration and end can not be foreseen. The largest powers of Europe armed as never before would take the field. None could be so completely defeated in one or two campaigns that it would declare itself vanquished and that it would have to accept the hard peace conditions imposed upon it. None would promise not to rise up again, even if only after years to renew the struggle. Such a war could easily become a seven years` or a thirty years` war. Woe to him who applies the torch to Europe, who is the first to throw the match into the powder cask.” – Field Marshal Helmuth von Moltke in a speech to the Reichstag on the 14th of May 1890. Born October 26, 1800, in Parchim, Mecklenburg-Schwerin, Helmuth von Moltke was the son of an aristocratic German family. Moving to Holstein at age five, Moltke’s family became impoverished during the War of the Fourth Coalition (1806-1807) when their properties were burned and plundered by French troops. Sent away to Hohenfelde as a boarder at age nine, Moltke entered the cadet school at Copenhagen two years later with the goal of entering the Danish army. Over the next seven years he received his military education and was commissioned as a second lieutenant in 1818. 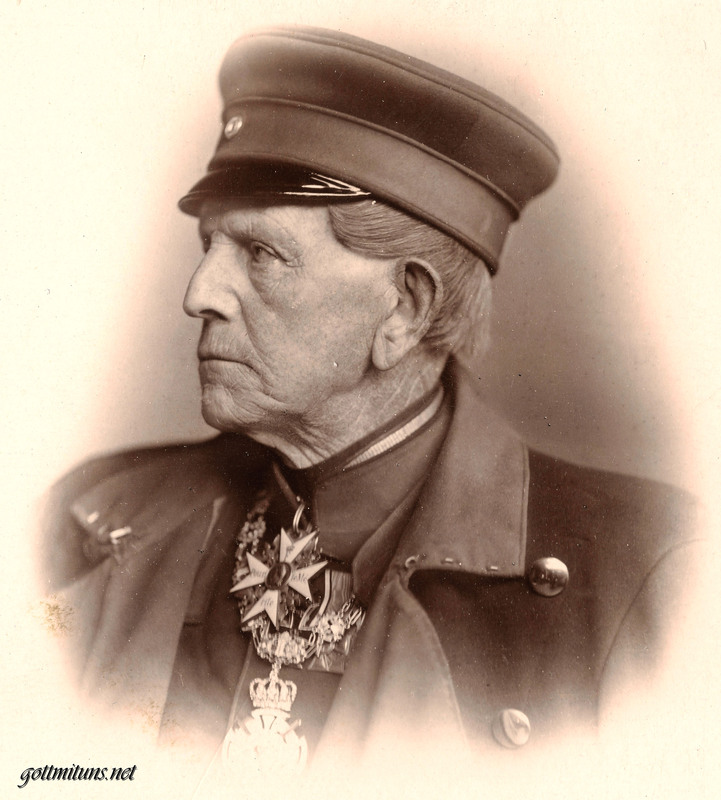 After service with a Danish infantry regiment, Moltke returned to Germany and entered Prussian service. 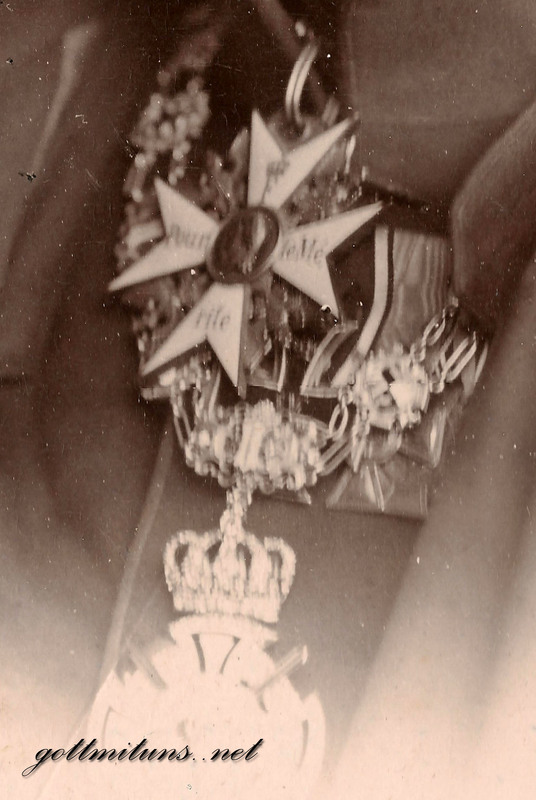 Posted to command a cadet school in Frankfurt an der Oder, he did so for a year before spending three conducting a military survey of Silesia and Posen. Recognized as a brilliant young officer, Moltke was assigned to the Prussian General Staff in 1832. Arriving in Berlin, he stood out from his Prussian contemporaries in that he possessed a love of the arts and music. A prolific writer and student of history, Moltke authored several works of fiction and in 1832, embarked on a German translation of Gibbon’s The History of the Decline and Fall of the Roman Empire. Promoted to captain in 1835, he took six months leave to travel through southeastern Europe. While in Constantinople, he was asked by Sultan Mahmud II to aid in modernizing the Ottoman army. Receiving permission from Berlin, he spent two years in this role before accompanying the army on campaign against Muhammad Ali of Egypt. Taking part in the 1839 Battle of Nizib, Moltke (who was in command of the Ottoman artillery) was forced to escape after Ali’s victory. Returning to Berlin, he published an account of his travels and in 1840, married his sister’s English stepdaughter, Mary Burt. Assigned to the staff of the 4th Army Corps in Berlin, Moltke became fascinated with railroads and began an extensive study of their use. Continuing to write on historical and military topics, he returned to the General Staff before being named Chief of Staff for the 4th Army Corps in 1848. Remaining in this role for seven years, he advanced to the rank of colonel. Transferred in 1855, Moltke became the personal aide to Prince Frederick (later Emperor Frederick III). In recognition of his military skills, Moltke was promoted to Chief of the General Staff in 1857. A disciple of Clausewitz, Moltke believed that strategy was essentially the quest of seeking the military means to a desired end. Though a detailed planner, he understood and frequently stated that “no battle plan survives contact with the enemy.” As a result, he sought to maximize his chances of success by remaining flexible and ensuring that the transportation and logistical networks were in place to allow him to bring decisive force to the key points on the battlefield. Taking office, Moltke immediately began making sweeping changes in the army’s approach to tactics, strategy, and mobilization. In addition, work began to improve communications, training, and armaments. As an historian, he also implemented a study of European politics to identify Prussia’s future enemies and to begin developing war plans for campaigns against them. In 1859, he mobilized the army for the Austro-Sardinian War. Though Prussia did not enter the conflict, the mobilization was used by Prince Wilhelm as a learning exercise and the army was expanded and reorganized around the lessons obtained. In 1862, with Prussia and Denmark arguing over the ownership of Schleswig-Holstein, Moltke was asked for a plan in case of war. Concerned that the Danes would be difficult to defeat if allowed to retreat to their island strongholds, he devised a plan which called for Prussian troops to flank them in order to prevent a withdrawal. When hostilities commenced in February 1864, his plan was bungled and the Danes escaped. Dispatched to the front on April 30, Moltke succeeded in bringing the war to a successful conclusion. The victory solidified his influence with King Wilhelm. As the King and his prime minister, Otto von Bismarck, began attempts to unite Germany, it was Moltke who conceived the plans and directed the army to victory. Having gained considerable clout for his success against Denmark, Moltke’s plans were followed precisely when war with Austria began in 1866. Though outnumbered by Austria and its allies, the Prussian Army was able to make near-perfect use of railroads to ensure that maximum force was delivered at the key moment. 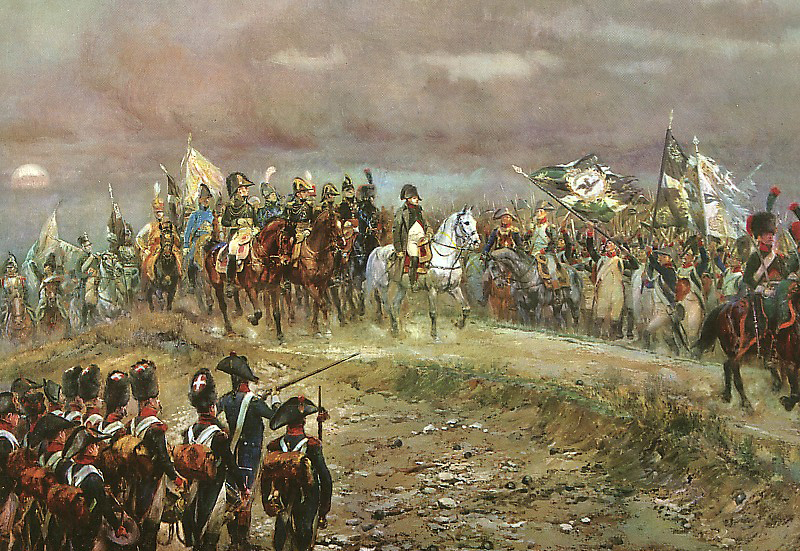 In a lightning seven-week war, Moltke’s troops were able to conduct a brilliant campaign which culminated with a stunning victory at Königgrätz. His reputation further enhanced, Moltke oversaw the writing of a history of the conflict which was published in 1867. In 1870, tensions with France dictated the mobilization of the army on July 5. As the preeminent Prussian general, Moltke was named Chief of Staff of the Army for the duration of the conflict. This position essentially allowed him to issue orders in the name of the King. Having spent years planning for war with France, Moltke assembled his forces south of Mainz. Dividing his men into three armies, he sought to drive into France with the goal of defeating the French army and marching on Paris. For the advance, several plans were developed for use depending upon where the main French army was found. In all circumstances, the ultimate goal was for his troops was to wheel right to drive the French north and cut them off from Paris. Attacking, the Prussian and German troops met with great success and followed the basic outline of his plans. The campaign came to a stunning climax with the victory at Sedan on September 1, which saw Emperor Napoleon III and most of his army captured. Pressing on, Moltke’s forces invaded Paris which surrendered after a five-month siege. The fall of the capital effectively ended the war and led to the unification of Germany. Having been made a Graf (Count) in October 1870, Moltke was permanently promoted to field marshal in June 1871, in reward for his services. Entering the Reichstag (German Parliament) in 1871, he remained Chief of Staff until 1888. Stepping down, he was replaced by Graf Alfred von Waldersee. Remaining in the Reichstag, he died at Berlin on April 24, 1891. On 21 and 22 October, as a stop on the way to Vienna, the Wangemanns and Devrient were guests of the venerable Field Marshall Count Helmuth von Moltke, who enjoyed a legendary reputation in the German Empire on account of his military successes in the three wars of German unification between 1864 and 1871. This visit too is well documented. 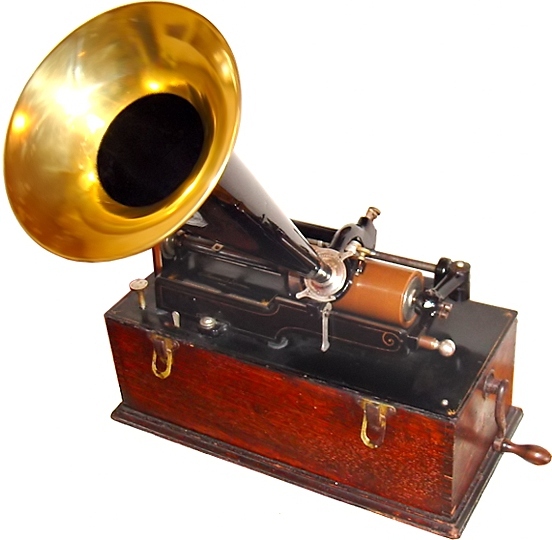 Wangemann played the cylinder of Prince Bismarck, whose voice Count Moltke recognized only after a correction of the playback speed, and had the roughly twenty relatives of the Count who were present speak into the phonograph one after another. At least four cylinders of Count Moltke’s voice were made on 21 October, of which only two are preserved. These are the only recordings of a person born in the eighteenth century which are still audible today. Wangemann had previously received a new cylinder shipment with blanks of brick-red color without a string core, which he used on this occasion. On the first cylinder, Count Moltke refers directly to Edison’s groundbreaking invention but has to repeat his statement, having named the “telephone” instead of the “phonograph” the first time around. After that, he recites a few lines from the first part of “Faust,” in which Goethe calls technological progress into question. Going over the Top – Diary of an officer of Infantry-Regiment 76. 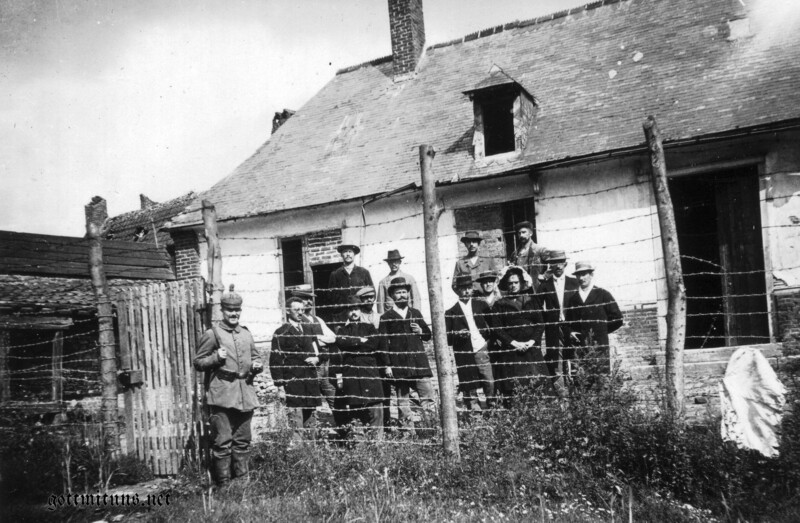 Vosges – France, 1915. The lines below have been taken from the diary/reminiscences of Leutnant Otto Ahrends who served as batallion adjutant in Infantry-Regiment 76. He was killed in action at the Somme in late 1916. Shortly after his death (in 1917) his diary was published by a group of the regiment’s officers to be sold to members and “friends” of the regiment. I finished reading it yesterday and want to share parts of it on this blog. The extracts I have chosen to translate are taken from the chapter “Battle”. During this attack the 2nd Batallion of IR76 lost 13 officers and 423 men killed. It is now 0930h, so still three hours to go until it starts. Some men are having breakfast, others are walking around. One group is looking at a map and is talking about what is going to happen. By now the artillery is firing without a break, sending iron greetings towards the French and filling the air with its evil sounds. The French artillery answers, some shells explode close to us without doing any harm. 1000h: “How long till it starts?” someone asks. A comrade next to me answers. “Still two hours to go!”. He carelessly looks at his pocket watch, like someone who is waiting for a train. 1030h: The companies assemble and the commander of our batallion holds a short speech. I see men looking at each other with faint smiles. Fathers thinking about their families at home. Young boys trying to hide their fears. A group of comrades. The French have intensified their fire. Some heavy calibers detonate right outside our trench. The ground is shaking. 1100h: Officers join their companies. They are dressed like the men, showing no sign of rank. “Gentlemen, set your watches, the exact time is 1117h.” There are no other orders. We all know what we are expected to do. Some comrades are telling jokes while others are quiet, staring bleakly into the distance as if asking fate what will become of them . The knotted trees, the smoke and the fog don’t answer them. Natures face is set in stone, they only hear their own pounding hearts. 1140h: Most men are smoking. Some vehemently draw the smoke into their lungs, others seem to be careless and relaxed, like being on a holiday tour, but then that is what it was supposed to be..a holiday tour, back home for Christmas. One by one the men move to their positions. 1150h: The batallion commander and myself are now in the foremost trench inside a dug-out with a field telephone. It’s double wired and can be carried with us during the assault. We are trapped here, surrounded by telephone operators and other staff officers. The only light comes from a small, quivering candle. No one says a word, the sound of men breathing is the only thing we hear. 1200h: Outside the world is getting torn apart. The last 20 minutes before the assault and our artillery fire has reached the peak of its intensity. All available guns, mine throwers and machine-guns have started firing. The ground is shaking and booming. Outside our shells keep detonating with a sound of 10000 hammers hitting an anvil. Only on this anvil human beings are smashed and broken, sending blood and bones flying. Death and madness are the only escape. Five minutes to go. The candle has fallen on the floor, but no one relights it. A comrade switches on his torch. It illuminates grim faces and blank stares, we are all trapped by the sheer force of violence surrounding us. 1210h: I have to resist the urge to block my ears. French artillery is sending heavy calibers towards us. Frantic explosions, as if the world itself is bursting. As if every last remaining scrap of culture, honor and humanity is supposed to be wiped out in these last few minutes. There must be a way to escape, a voice shouting “Halt!”. It can not be that we will have to cross this ocean of fire and pain. No it can not be. It must not be. But still the hammers continue to pound the earth. Hell has broken loose. Death and perdition are grinning at us. An image of Max Klingers “Stomping Death” passes my inner vision. Another look at the watch. At home it will be breakfast time now, time for a walk in the park. Don’t go outside! You must not leave the house! Death is waiting! But they can’t see it, they can’t see us, they do not know what is happening here. They know nothing. Obscure images of home, of my family and my past are flashing around my mind. The heat inside this dug-out is unbearable. Dozens of people are crowded around us, pressing their bodies into the walls, taking cover in the corridor leading into the trench, trying to hide from the shrapnel. All thoughts are focused on the clock hands creeping forward. Slowly, relentlessly, ignoring our fears and laughing at our hopes to escape the horror and the suffering that awaits us. All thoughts focusing on the realisation that there might only be 6, now 5, now 4 minutes left to live. The stringent necessity of the few remaining minutes runs through us like a stream. Tension rises, men are standing up. What once was is fading. Rifles and equipment are checked, everyone is waiting for the signal. 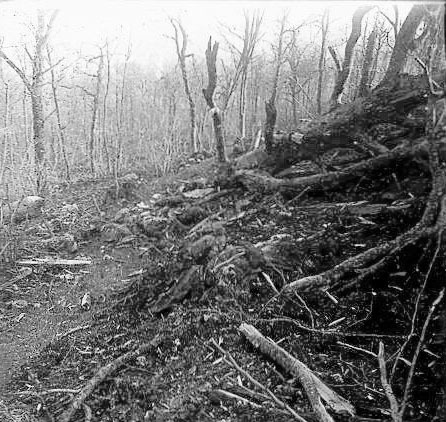 We enter the trench and here on the outside thousands of treetops are weighing as if trying to shield us and the horror from the world outside. 1220h – A whistle is sounding. The trench is getting alive. The first wave, out they go, running, jumping, stumbling. Bullets whistle past. A man next to me is thrown back into our trench. It will be our turn soon.. It is over. I order the men to recover the body of our commander and slowly walk across the battlefield to see who is still alive. 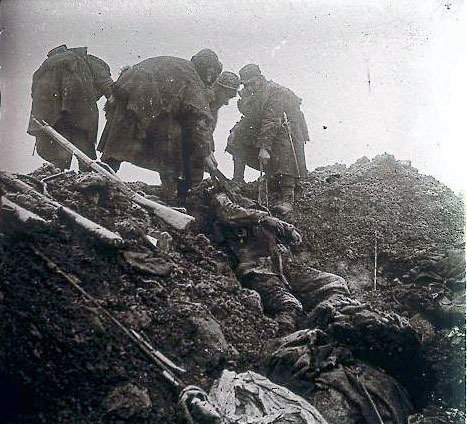 The first dead bodies lie where they fell when enemy bullets tore into them just when they had left the trench. I can hear men moaning and screaming. The ground is torn, it is steaming from the impact of heavy artillery shells and everywhere around me is sorrow and pain. Big oak trees lie uprooted, treetops, branches and twigs are lying everywhere making it difficult to find a path through the barbed wire. Death has had a rich harvest. 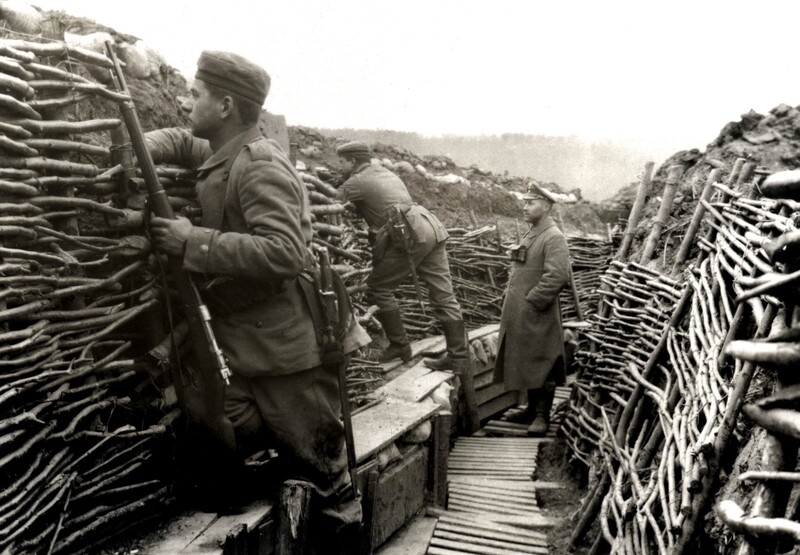 In the first trench the dead bodies of friend and foe lie intermingled as if still in combat with each other. 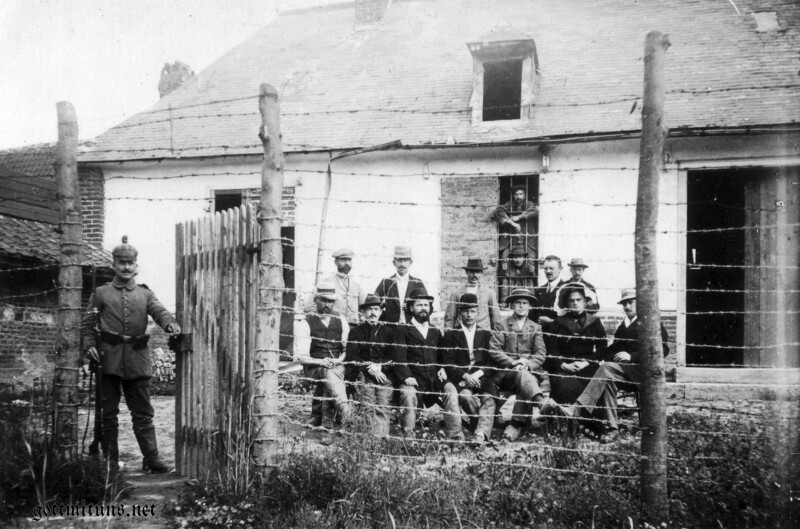 One is hanging inside the barbed wire, his bayonet still thrust into the eye of a Frenchman. 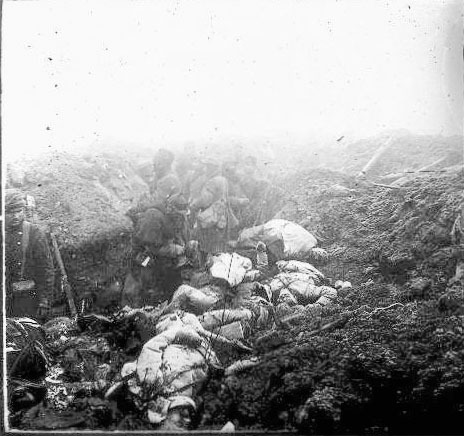 Inside the trench a heap of French soldiers killed by an artillery shell. Even in death their faces show the horror and fear they experienced in the last seconds of their lives. 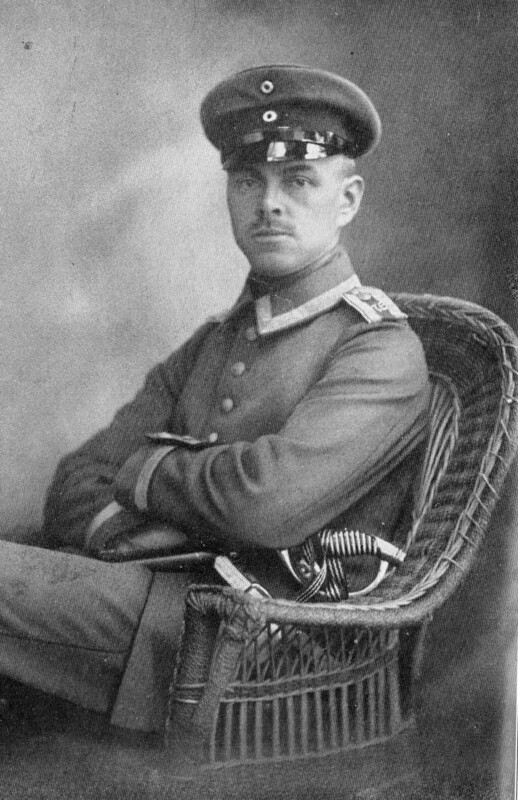 Leutnant von X. is dead, Leutnant Y. aswell, I had been speaking to both of them only an hour ago. A row of 12 dead comrades kneeling next to each other, just in front of the enemy trench. A machine gun must have got them. Dead and maimed bodies are everywhere. Pools of blood seeping from skulls ripped open. Staring eyes, eviscerated bodies, legs and arms torn off, a comrade with a headshot who seems to be sleeping. This is the face of war….